Deciding on the best time to load up your fishing gear and hit the water is a big decision for many anglers. You don’t want to spend hours trying to get a bite when the fish are not actively feeding; you want to go when you’re most likely to catch fish. There are a variety of factors that will influence the behavior of your target fish, and there aren’t many hard-and-fast rules regarding the best times of day to try your luck. However, we’ll talk about these factors and try to help you figure out the best time of day to catch a limit. We’ll start by examining the four basic windows of time in each day and explaining what types of fish or techniques are likely to work in each. Water temperatures are at their lowest in the early morning, right before dawn. This can make this an excellent time to fish in the late spring, summer or early fall when the daytime temperatures soar. Additionally, you’ll typically see very few other people at this time of day, which means you won’t have to contend with splashing swimmers and loud kids. The low light levels at this time of day can also be helpful when fishing for species that see well in low light conditions, such as bass and catfish. Flying insects are often quite active during early summer mornings, which can also make it a good time to catch trout, bluegill and other fish who frequently eat insects at the surface. However, early morning is not a great time to fish in the winter. Because the water and air temperatures will typically be at their lowest for the 24-hour cycle, most fish remain relatively inactive during these times and wait for the sun’s rays to warm the water a bit. The time between late morning and early afternoon often presents very difficult fishing in the warmer parts of the year, as most fish will swim deep in search of colder water. The sun’s rays are also at their strongest during this time of day, which will encourage bass and other fish to lay low, as their prey’s vision often works very well during this time, making it hard to hunt. 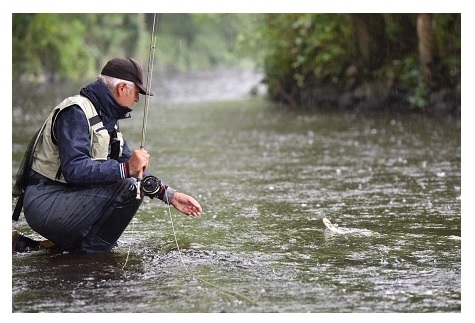 But windy, rainy or overcast conditions can improve your chances of catching fish during the daytime. Wind, clouds and rain all reduce the amount of sunlight that’s able to penetrate the surface, and they’ll usually reduce the temperatures a bit too. If, on the other hand, you are fishing in the colder portions of the year, this is clearly your best – potentially the only – time of day you have a reasonable chance of success. The sun’s rays will warm the cool water, enabling the fish to move around better and feed. 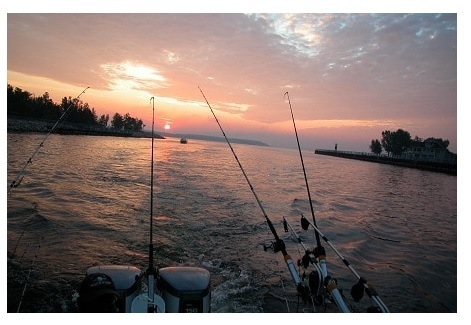 Like early morning, late afternoon is often a productive time of day to fish during the spring, summer and fall. The sun’s low position in the sky allows the water to begin cooling off, thereby encouraging the fish to become active and feed. The dimmer lighting will also help to stimulate predators like bass, who like to feed in dim light. Just remember that the morning pattern will unfold in reverse fashion in the afternoon. The temperatures and light levels will be falling with every cast, instead of rising, as they do in the morning. Also, the shadows will differ too – if the east bank of a lake is shaded in the morning, the west bank of the lake will likely be shaded in the afternoon. The earliest parts of the afternoon may remain productive in the winter, but the fishing action will often calm down quickly as the sun begins to set. When the weather is warm, the period between sundown and midnight (give or take) is often very productive. You’ll have to factor in the lack of light when deciding on your approach, tackle and techniques, but many prized gamefish – including bass, catfish and, most notably, walleye – often feed aggressively during the first half of the night. Moon-lit nights often provide excellent topwater fishing action, as your lure will be very visible to the fish from below. The fishing often slows down as the night progresses and the temperatures continue to drop. 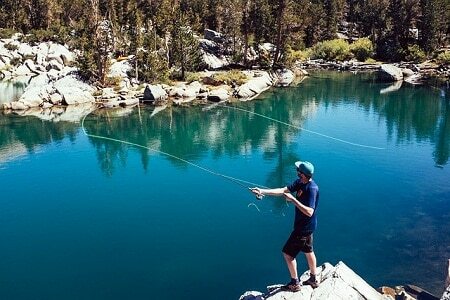 However, you can still occasionally catch fish during this time, so it doesn’t hurt to try. Cool weather will make nighttime fishing considerably less productive. Few fish feed heavily in the winter, and even fewer choose to do so in the middle of the night. 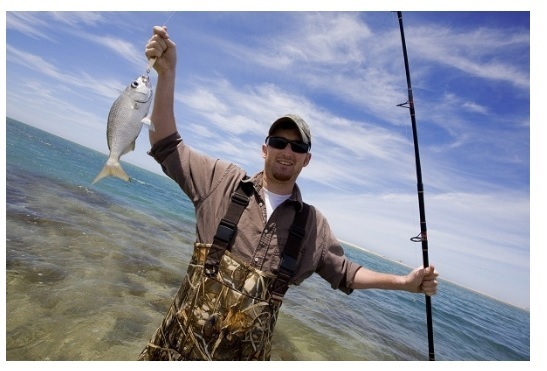 If you’re fishing in saltwater – particularly if you are surf fishing from the beach – you’ll also want to pay attention to the tides. Many anglers find incoming tides to be the most productive time to fish, but others like to fish during outgoing tides instead. However, most will agree that slack tides, when the water isn’t moving, is rarely very productive. Because there are two high tides and two low tides each day (offset by 12 hours), you can usually find your preferred tide during a good time of day to fish. As mentioned earlier, weather patterns can alter the time of day in which the fish will be most active. A light rain, for example, can cool the water and disrupt the surface. This can make for great mid-day fishing, even in the middle of the summer. Conversely, cold rains can make it nearly impossible to catch fish during the late fall through early spring, even during the middle of the day. You certainly want to consider the way the time of day will affect the fish but be sure to think about how the various times of day will affect you. This will help you not only stay safer, but more comfortable too. And generally speaking, comfortable anglers will catch more fish – and have more fun in the process — than miserable anglers will. For example, if you are fishing during the middle of the day in the spring or fall, you’ll want to be sure to wear plenty of sunscreen and a hat to protect you from the sun’s rays. 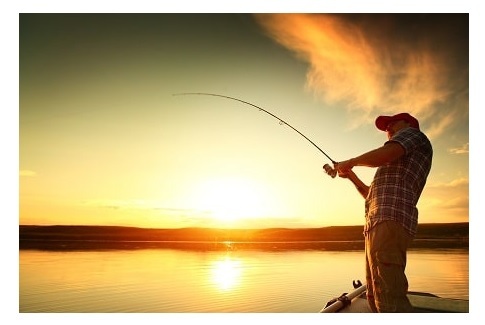 It’s also important to protect yourself from the sun during the summer, but you’ll usually be fishing in the morning or afternoon during the summer when the sun’s rays are weaker. It’s also wise to consider that bugs are typically most active during the late afternoons (and, to a lesser extent, the early mornings). Just be sure to apply plenty of bug spray and wear long sleeves and pants if necessary, to protect you from biting bugs. Night fishing presents an entirely different set of challenges. Mosquitoes and bugs can still be active (particularly during the early hours of the night) during the night, so be sure to apply plenty of repellent, but you obviously won’t need any sunscreen. In fact, your primary problem will be replacing the light normally supplied by the sun. A good flashlight or lantern is a must, but you’ll probably also want to bring along a headlamp or a strap that will hold a small flashlight on your head. This will allow you to see what you’re doing while keeping your hands free. It is certainly helpful to fish during the most productive time of day for the season and current conditions, but that doesn’t mean you must stick to the guidelines listed above. Anglers occasionally get lucky fishing during the “wrong” times, and there’s little harm in hitting the water anytime you like. Ben Team writes about outdoor recreation, natural sciences and environmental issues. Read more by Ben at www.FootstepsInTheForest.com.